Suggested Use: 1 tablet 3 times a day or as directed by a health care professional. 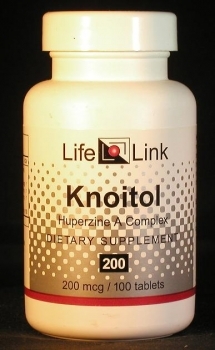 Knoitol makes prescription drugs for Alzheimer’s look like snake oil. Huperzine-A (HupA), a substance found in the club moss Huperzia serrata, has been used in China for centuries. The Chinese Academy of Sciences took a renewed interest in HupA in the 1980s and developed it as a treatment for dementia, particularly the dementia of Alzheimer’s Disease. repair of stroke damage in the brain. increases the brain’s production of NGF receptors — cell-surface proteins that are required for NGF activity. Most recent clinical studies of huperzine-A use 400–800 mcg/day. Huperzine-A (HupA), a substance found in the club moss Huperzia serrata, has been used in China for centuries to treat swelling, fever, and blood disorders.1 The Chinese Academy of Sciences took an interest in HupA in the 1980s and developed it as a treatment for dementia, particularly the dementia of Alzheimer’s Disease. Accordingly, we will limit our discussion of huperzine-A to a brief summary of recent research, and let you draw your own conclusions about what medical conditions it may be effective in treating. Animal studies have shown that HupA protects the nervous system from organophosphate nerve-gas agents.2,10 This fact has no relevance to supplement buyers except insofar as it provides further evidence of huperzine’s powerful neuroprotective action. HupA appears to affect multiple biochemical pathways in the brain, several of which are involved in Alzheimer’s Disease. The best understood of these pathways is the one in which the neurotransmitter acetylcholine carries signals from one nerve cell to another in certain parts of the brain. In Alzheimer’s Disease, there is a shortage of acetylcholine, and consequently an impaired signalling ability. HupA is an inhibitor of the enzyme that breaks down acetylcholine. Thus, HupA causes this neurotransmitter to accumulate in the space between the cells, permitting higher levels of signalling to take place. It protects nerve cells from free radicals generated by the ‘beta-amyloid’ protein plaques found in Alzheimer’s brain tissue. It interferes with the formation of these destructive beta-amyloid plaques. It interferes with the ‘suicide’ programming that causes nerve cells to die when they receive spurious ‘time-to-die’ signals, as they do under Alzheimer’s conditions. It increases the brain’s production of nerve growth factor (NGF) — a substance involved in generating replacements for lost cells. It increases the brain’s production of NGF receptors — cell-surface proteins that are required for NGF activity. Until recently, supplement companies sold huperzine as a cognitive enhancer for people whose cognitive abilities fell into the normal range, and the dosages were small — 50 mcg/day, for example. But now that the Chinese studies on Alzheimer’s patients have become known outside of China, it is realized that larger doses are needed. The latest clinical studies use 400–800 mcg/day.9LifeLink has therefore increased the dosage in its hupA product Knoitol to 200 mcg. Does huperzine repair stroke damage? Are huperzine supplements useful for the conditions and purposes mentioned above? We aren’t allowed to tell you, so you should take a look at some of the references cited here, and then decide for yourself.